Should I admit that I was v. v. v. tempted to title this, "piggies in pink?" 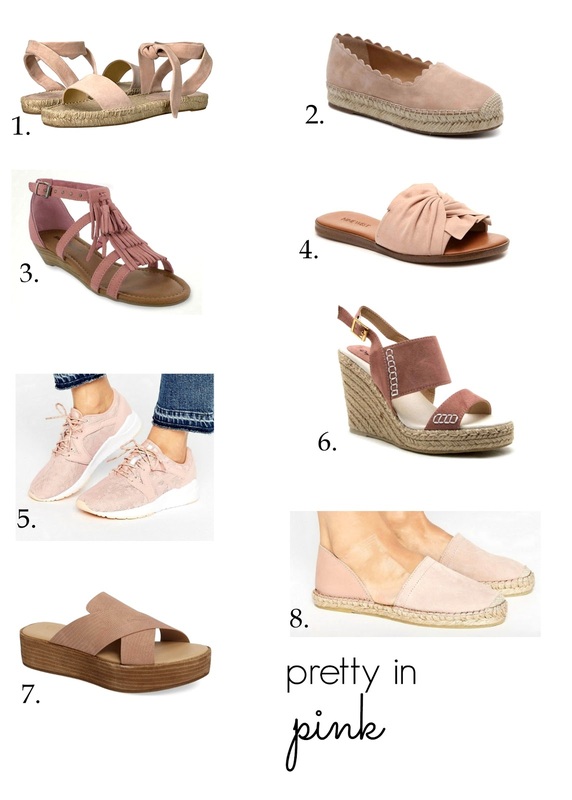 My love and admiration for all things pink/blush/champagne/dusty rose/shall I go on is still shining bright like a candle in the trendy wind and so after I caught myself bookmarking yet another pair of light pink footwear - I thought I'd share. 1. Splendid Jody - I feel like I could call every pair my favorite but I do really love these. I have a couple pairs of espadrilles from this brand and can vouch for their comfort and quality. Phoebe says these are her favorite so that should count for something. 3. Minnetonka Marinas - Julia had the kids version of these last year and wore them every chance she got (a positive in my book because it means she can put them on herself and they are comfortable) I love the slight wedge but that they still look long-periods-of-time wearable. You know? I know you do. 4. Melenda Flats - maybe not super practical but you can't argue that aren't CUTE and a lot cheaper than a lot of similar styles I keep seeing popping up. 5. Asics - because I wear tennis shoes a good portion of every single day I always try to bridge the gap between practical and cute and I think these fit the bill. Right? Right. 6. Wedge Sandal - I might always be a sucker for a pretty wedge. 7. Coconuts cross strap platform - I have a pair very, very similar to this but the pink is just a lot more fun, I think. 8. suede espadrille - If'/when espadrilles go out of style will be a sad, sad day in Graceland because I love them. I'm still holding out hope that Target brings back my favorite pair from last summer but if not - these will be mighty tempting. Of note! These pretty chucks are currently 40% off if you're looking for a fun twist on the traditional white that everyone seemed to be rocking the past few summers. And I'll leave you with that! Julia has requested that I go hunt for some purple footwear so -- duty calls! I didn't know I needed pink shoes, but now I have to have #2, 3, and 5 in my life immediately. I'm currently rocking these and am SO in love with them!